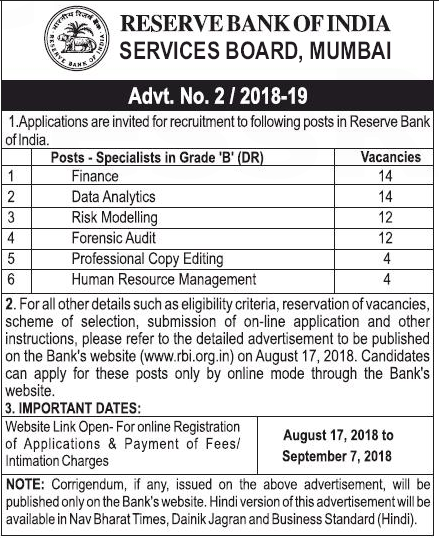 Reserve Bank of India has issued a notice to invites applications against Specialists Vacancies of 60 Posts.Candidates with the required eligibility criteria are invited hereby for filling and submitting the online application form for the current openings on or before the closing date (7th September 2018). 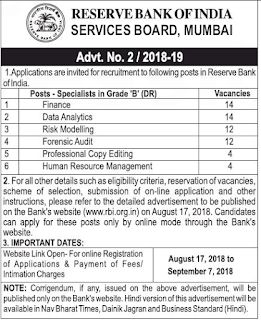 The selection of contestants who are participating under RBI Recruitment 2018 shall be through the Written Exam / Personal Interview. Commencement of Online Application Form Is : 17-08-2018. Online Registration of Application Form Ends On : 07-09-2018.